Weighty Matters: Did Michael Phelps Sell Out? 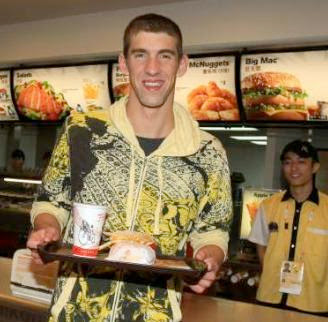 There's been a lot of uproar in obesity circles over Michael Phelps' endorsement deals with Kellogg's Frosted Flakes and McDonald's. Some folks have even forwarded me the articles figuring I'll take out my mallet and hammer Micheal good. Well folks, sorry to disappoint. While I certainly don't think that Mr. Phelps' choice of partners belies a healthy lifestyle, where in the Olympic rulebook does it say he's only allowed to endorse healthy products? Sure, in an ideal world Mr. Phelps might have turned down those endorsements but in place of what? Does someone have millions of dollars to throw at him to endorse broccoli? Mr. Phelps isn't a doctor, a dietitian or public health advocate. He's a swimmer. If you really want to pick on someone for their inappropriate McDonald's endorsement try dietitian Dr. Rovenia Brock (aka Dr. Ro) or physician Dr. Dean Ornish. "Although he has the opportunity, he isn't required to set a wonderful example. Working hard and winning a bunch of gold medals in sports... I guess that just isn't a good enough example. Putting his face on something kids are already eating and possibly inspiring them to try swimming or sports in general, now that's awful!"